The first version of the schedule for the year has been uploaded into the calendar on the web page. The schedule will be uploaded into Bench App in the next week. For new Smokettes, once you have paid your fees for the year you will be given access to Bench App. Looks like sign up night will either be Friday September 15th or Saturday September 16th, to be confirmed. Fees this year will stay the same at $225 for the season. A doodle poll will be sent out tomorrow with options of dates for the sign-up night at Mallory's house September 8th, 9th, 15th or 16th. We have direct deposit now for the Smokettes! More info to come at sign-up night. First ice time, Sunday September 17th with the Lonestars on the big ice in Trail. 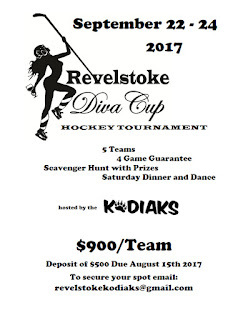 First tournament Sept 22,23 and 24th in Revelstoke, see attached poster. Let me know if you want to be the chair for this tournament. Next Tuesday the 22 of August, Smokettes and friends golf at Redstone. 5pm shotgun start, call the clubhouse to sign up 250-362-9141. Anna Hogarth is stepping down from the Co-Ed Kids REC Hockey program and the program is now without a Coach. I’m emailing to see in any of you, or anyone you know would be interested in filling those shoes (skates)? Would you please let me know if you’re interested, or know anyone who might be? The program runs for approximately 20 sessions – from the start of the season (October) to the end of the season (early March) with a 2 week break over Christmas.